DETROIT, MI–U.S. Nationals is always full of surprises. Everyone has their predictions and plans coming in; then the competition begins, and the surprises start coming. Never was that more true than in the pairs event this year at Nationals. Coming into Detroit, no one knew what to expect from Ashley Cain and Timothy LeDuc. Cain suffered a concussion in December, following a lift accident at the Golden Spin of Zagreb event in Croatia in December. But, just seven weeks later, Cain and LeDuc overcame that setback to score an unexpected–and heartwarming–win in Detroit for their first national title. Not only did they win, they did so with a 10-point margin of victory. After their solid short program, Cain and LeDuc skated an even better long program on Saturday to clinch the title. The couple opened their W.E. free skate with a solid triple twist and then hit their signature element, the side-by-side triple loop jumps. From there, they cruised, landing a strong jump combination and clean throw triple Salchow. The lifts were completed without issue, and Cain/LeDuc also shone in their choreography and transitions, bringing the audience to its feet at the end of their program. They were well-rewarded with a huge score of 141.89. Following their victory, Cain and LeDuc were named to the U.S. team for Worlds and Four Continents. Haven Denney and Brandon Frazier also surprised by moving up from third place after the short program to take the silver medal. The couple came into Nationals off a frustrating fall season during which Denney suffered a painful stress fracture. “It was bothering her before Autumn Classic,” said Frazier after the short program. However, Denney and Frazier turned things around in Detroit, clinching silver with a strong and emotional performance in the free skate. Skating to poignant music by The Irrepressibles, Denney and Frazier opened their program with an excellent triple twist that earned all +4s/+5s from the judges. They struggled on the side-by-side jumps, losing some points on those elements, but landed both throw jumps cleanly. Their lifts were very good, with lovely positions and nice speed, again drawing +4s/+5s. This long program, choreographed by Charlie White, showcases a new maturity from this team, with Denney in particular showing great emotion and flair in her skating. They earned a score of 133.32 points. “This season, I think the biggest thing for us is we’ve really reignited that fire and passion we have for the sport,” said Frazier. Denney and Frazier will look to carry that momentum into Four Continents Championships. Deanna Stellato and Nathan Bartholomay won the bronze medal at Nationals for the second consecutive year. They skated their cleanest long program of the season, holding nothing back in their interpretation of Whitney Houston songs from The Bodyguard. Stellato, in particular, sold the program to the max (employing a special eyeshadow look to help out). Technically, it was a solid skate. Stellato/Bartholomay opened with a level 4 triple twist, followed by side-by-side triple Salchows. Their throw triple loop, midway through the program, was a highlight, as was their final hip carry lift. They did have a few slight errors on elements, but nothing major. They earned 131.74 for third place in the free skate/overall. Stellato and Bartholomay were named as alternates to the Four Continents and Worlds teams. Coming into Nationals, 2016 U.S. champions Tarah Kayne and Danny O’Shea were expected to contend for the title. And they got off to a great start by winning the short program. Everything seemed within Kayne and O’Shea’s grasp as they started their Swan Lake long program. On their second element, Kayne stepped out of the side-by-side triple Salchow and missed the second jump in the combo. But they recovered well with two strong throws and solid side-by-side double Axels.They were steadily building momentum in their dramatic Swan Lake program when, suddenly, it all fell apart. Something went awry on the entrance to their final lift … and it never got up in the air. With that error, they immediately lost 6 to 7 points off their score. The program that had looked set to end in triumph instead limped to a close, with anguish clearly written on Kayne’s face. She sobbed in the kiss-n-cry as their score of 126.81 was announced. Kayne and O’Shea finished in fourth place. Another Nationals surprise … in this case, quite an unwelcome one. The silver lining for Kayne and O’Shea? They were named to the U.S. Four Continents team, where they will come in as the defending champions, and will also be first alternates for the Worlds team. The competition ended on a happy note for Jessica Calalang and Brian Johnson, who unexpectedly took fifth place in only their first season together. The new team put out a pretty good program technically. Although they got an underrotation call on their side-by-side triple Salchows, they completed the rest of their jumps relatively well, with just minor errors. Their death spiral, pairs spin, and lifts all earned positive GOE marks. And their Nocturnal Animals long program, choreographed by Rohene Ward, had some lovely moments and a nice flow and mood overall. They scored 120.48 for their long program. Although they’re still gelling as a team, Calalang and Johnson show promise for the future. Calalang has nice detail, extension and personality to her skating, while Johnson brings strong partnering skills. Audrey Lu and Misha Mitrofanov placed sixth in their first year as seniors at Nationals. The young team showed off impressive jumping skills in the long program, hitting a level 3 triple twist, two good throw jumps, and two clean side-by-side jumping passes. However, they struggled with all three lifts in the program. And although they presented their Moulin Rouge long program well, they don’t have quite the maturity, line, and connection of the older teams in this event. They scored 116.21 for their free skate. The team said they really appreciated the support they received from the crowd during their lift problems in the long program. “Yeah, that helped us get through it,” Lu agreed. Probably the biggest shock of the day was seeing defending champions Alexa Knierim and Chris Knierim finish in a disappointing seventh place. The Knierims opened their program with a gorgeous triple twist that earned all +4s/+5s. However … then things just fell apart. Both side-by-side jumps were doubled and had other errors as well. They struggled with their Axel lasso lift, which came down early. Alexa landed both throw jumps, but one was slightly two-footed. And then, just as with Kayne/O’Shea, their final lift failed to get off the ground. Their “Wicked Games” free skate is a lovely program, but just lost all spark in Detroit, what with the mistakes. Unfortunately, it just seemed like something was very off for the Knierims at this event. They scored 109.86. Afterward, Chris Knierim told NBC that he’s been suffering from torn wrist ligaments and will need surgery. Despite this, the Knierims were named as alternates to the Four Continents and Worlds teams. Nica Digerness and Danny Neudecker had a pretty good competition in Detroit to place eighth. The couple didn’t quite meet their goal of placing at least in the top six. However, they did improve on their 11th place at last year’s Nationals. Digerness and Neudecker’s long program to “Arrival of the Birds” was soft and appealing to watch. Digerness, in particular, shows lovely posture and finesse in her skating, finishing off every move beautifully. The couple’s technical highlights included a strong throw triple toe loop and a very good Axel lasso lift. Their throw triple loop was also big, if two-footed. Digerness/Neudecker struggled a bit on their side-by-side jumps, but ended the program nicely with a solid death spiral and pairs spin. They totaled 104.79. Erika Smith/AJ Reiss finished ninth. Both skaters had surgery during the off-season and were happy just to be able to compete in Detroit. Smith/Reiss reprised their Beauty and the Beast long program from last year, to somewhat mixed effect. They had several big mistakes on their jump elements; Smith fell on the throw triple loop and popped both of the side-by-side jumping passes. However, all three lifts were very good and well-set to the music. Their forward inside death spiral was also a highlight, with an innovative exit. It’s unfortunate that Smith/Reiss haven’t been able to skate this program cleanly yet in competition, because it’s really quite lovely and builds to a strong finish. Although plagued by injuries, this team continues to show flashes of potential. They scored 106.27 in the free skate. Winter Deardorff and Max Settlage were 10th. Now in their second season together, Deardorff and Settlage showed nice improvement in Detroit, finishing 2 spots higher than at last year’s Nationals. They completed some good technical elements in their long program, including a throw triple flip and a solid side-by-side double Axel/double toe combo. Their lifts were also much improved over their early-season appearance at U.S. International Classic. Their “Hotel California” program was pleasant to watch, but lacked choreography or interpretation that felt specific to the music. They scored 101.66. 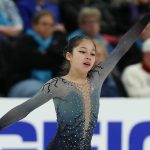 It was certainly a day of surprises in the pairs event at U.S. Nationals. Even more so than usual.